It's way past my bedtime, but we had a gig tonight south of Birmingham for a community arts alliance. I love these folks because they support original music. Some places only want cover tunes, and I get that. Most people that go to restaurants and bars want to hear familiar songs. The people tonight were gracious, and they booked us to play for another function in October. We both are bone tired tonight, and we're off tomorrow, so we plan to sleep in...at least until 7 a.m. I hope you all have had a remarkable day. Seven am is NOT sleeping in for me!! Seven am is a sleep in for me too. I hope you get it, and am glad the night went well. Sounds like a day off will definitely be appreciated at your house ! Happy Friday ! I only get up that early for fishing or golf. Glad to hear that your music was so well received. Have a terrific weekend. Im up whenever the sun tells me to get up. Usually thats 6:30 or 7:00. When my eyes open in the daylight, Im up. Hope yall get good rest and congrats on landing another gig. Glad to know that your music is appreciated! We are up around 8, but I add some time to try to get back to sleep. Call me lazy. 7am is a sleep in for many of use I was up at 6.40am when Leo came in to tell me he was awake and would I get up, which I did then he returned to papa's office to play Xbox and I have only seen him a couple of time, I have asked if he wants breakfast but no he says not. Congrats on another booking! Try to sleep in till at least 8:00am! LOL! The picture with the peppers is haunting me with its beauty. 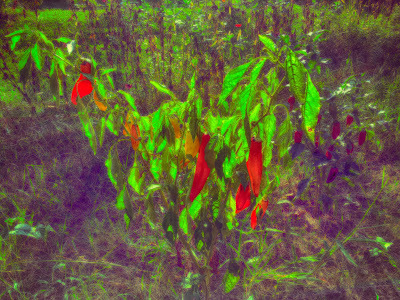 In clothing, green and red is bad taste, the colors don't go together, but it seems in Nature, in the veggie garden, everything goes well together.